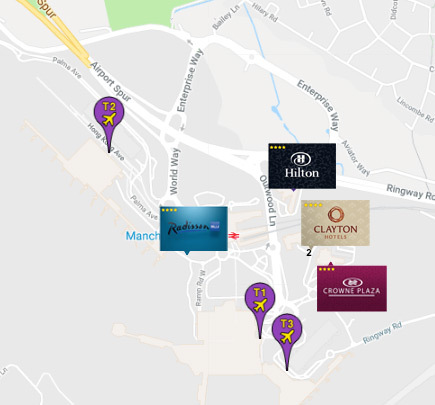 Here at Holiday Extras, we can offer you a range of fantastic hotels that are located only moments from departures - perfect if you're looking for a hassle-free start to your holiday. Our on-site airport hotels are within walking distance of all terminals, and you won't have to worry about moving your car in the morning. We can offer the fantastic Radisson Blu, connected via a covered walkway, and the Hilton, Crowne Plaza and Clayton, all within a short walk to the terminals, or a quick transfer via a shuttle provided by the hotels. The Radisson Blu at Manchester airport is the ultimate in luxury. For those looking to start their holiday before they even get on their plane, look no further! This hotel has its very own pool and leisure facilities, so you can kick-back and unwind without even having to venture off airport grounds. Prices starting at £108 for an overnight stay, and we can even offer you exclusive deals on room and airport parking packages, so you won't have to give your vehicle a second thought. This fantastic 4-star hotel is the most luxurious hotel closest to Manchester airport Terminal 2, taking only 5 minutes to reach check-in. If you're flying from Terminal 1 or 3, well, good news - it's still only a short walk! It has direct access to all three terminals via an elevated walkway, and you'll be at T1 in 10 minutes and T3 in 15 minutes. The Hilton is another of our most luxurious hotels on offer. With its own on-site gym, a delicious breakfast and a sumptuous Italian restaurant, this one is a firm favourite amongst Holiday Extras' customers. Prices start at £80.10 for a one night's stay, and if you're bringing your car, we even have some top-notch room and airport parking packages you can take advantage of. This modern 4-star hotel is located on the airport grounds, and provide a complimentary shuttle service to each terminal. Simply give the reception at least 15-minutes notice and hop-on! The shuttle takes only 4 minutes to reach all three terminals. You'll be spoilt for choice at the Crowne Plaza near Manchester Airport. With three eateries to choose from, and several room options to select between, there's something for everyone. The 4-star Crowne Plaza endeavours to make your stay as convenient as possible with its on-site ATM and flight information board, as well as helping guests indulge in a touch of luxury with its very own sauna. Prices start from only £89 for a room-only stay, but we can also offer you room and parking packages starting from just £104 with a week's parking! To get to the terminals, the Crowne Plaza runs its own, complimentary 24-hour shuttle service, so you'll have absolutely nothing to worry about on the morning of your flight. The shuttle takes only two minutes to reach T1 and T3, and four minutes to reach T2. The 4-star Clayton hotel is one of the highest rated at Manchester Airport - and it's no wonder. With its comfortable, spacious rooms and stunning on-site restaurant, you can unwind and relax only moments from the terminal. Prices start at £70, but our room and parking packages are not ones to miss. With our exclusive offers, you can get a room and a week's parking at this hotel, from only £85. Bargain! What's more, the Clayton is located only an eight minute walk to Terminal 1 and 3, and 16 minutes to Terminal 2. But if you'd like to avoid crossing the busy airport roads, you can take a free, 24-hour shuttle bus that takes only 2 minutes to reach T1 and T2, and 5 minutes to reach T3. Not only can you stay just moments from Terminal 1, 2 and 3, but you can also save your money by combining your room and parking booking in one of our exclusive packages, for one easy price. The savings we can offer are huge, and a package with a week's parking included can offer much better value for money than a room-only booking. Take a look at our main Manchester Airport Hotels page to compare all the deals and packages we have on offer. There's nothing like staying really close to the airport, but with Holiday Extras, you can get a brilliant price too. While booking a hotel at Manchester airport can be quite costly, booking in advance with us means you could save up to 70% off the full price and ensure you spend your money where it really counts: on your holiday. You'll also get the chance to add a Manchester airport lounge to your booking. Holiday Extras can offer the Bollin Servisair Lounge and the Escape Lounge. After checking-in, simply relax with three hours peace and quiet in an airport lounge. Getting your holiday off to the perfect start has never been easier.